The Global Volcanism Program has no activity reports for Boset-Bericha. The Global Volcanism Program has no Weekly Reports available for Boset-Bericha. The Global Volcanism Program has no Bulletin Reports available for Boset-Bericha. Boset (Boseti-Gudda) and Bericha (Boseti-Bericcia, also known as Bariccia) are composite dominantly rhyolitic-to-trachytic volcanoes rising above the floor of the Ethiopian Rift valley. Initial basaltic-to-trachytic activity at Boset followed by rhyolitic effusive and explosive eruptions resulted in the formation of a caldera, a remnant of whose rim is found on the NW flank. Elsewhere, post-caldera activity produced very recent pantelleritic obsidian fissure-fed lava domes and flows that buried the caldera wall. Flank eruptions from fissures parallel to the rift produced voluminous pantelleritic lava flows. Bericha has produced similar very recent obsidian flows and associated pumice flows. Fissures connecting Boset and Bericha have erupted youthful, prehistorical basaltic lava flows. Brotzu P, Morbidelli L, Piccirillo E M, Traversa G, 1980. Volcanological and magmatological evidence of the Boseti volcanic complex (Main Eithiopian Rift). In: Geodynamic Evolution of the Afro-Arabian Rift System, Roma: Accademia Nazionale dei Lincei, p 317-365. The Global Volcanism Program is not aware of any Holocene eruptions from Boset-Bericha. If this volcano has had large eruptions (VEI >= 4) prior to 10,000 years ago, information might be found on the Boset-Bericha page in the LaMEVE (Large Magnitude Explosive Volcanic Eruptions) database, a part of the Volcano Global Risk Identification and Analysis Project (VOGRIPA). There is no Deformation History data available for Boset-Bericha. There is no Emissions History data available for Boset-Bericha. 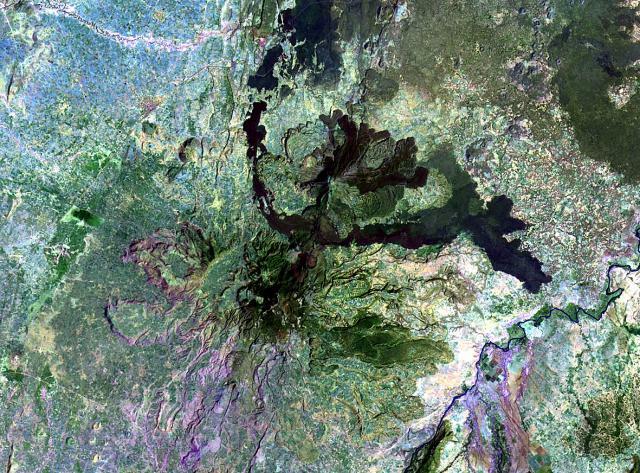 Two closely spaced volcanic centers, Boset (Boseti-Gudda) and Bericha (Boseti-Bericcia) are composite dominantly rhyolitic-to-trachytic volcanoes rising above the floor of the Ethiopian Rift valley. Boset, the SSW center (also known as Gudda), is below and to the left of the center of this Landsat image, while the NNE center, Bericha, lies just above the center of the image. Fissures connecting Boset and Bericha have erupted youthful, prehistorical basaltic lava flows. There are no samples for Boset-Bericha in the Smithsonian's NMNH Department of Mineral Sciences Rock and Ore collection. Large Eruptions of Boset-Bericha Information about large Quaternary eruptions (VEI >= 4) is cataloged in the Large Magnitude Explosive Volcanic Eruptions (LaMEVE) database of the Volcano Global Risk Identification and Analysis Project (VOGRIPA).